I sometimes have students who contact me with very unrealistic expectations. I am writing this to give you the reality. Some have the idea that they will take a one week intensive class, then run home and hang out a shingle that says “professional engraver” and the world will beat down their doors to give them more business than they can handle. Some are craftsmen or business owners who have a single project (or run of a project) they want engraving on. They have the idea that they will send an employee, or come themselves, and walk out of the class with the abilities to do the project after a week. This is fantasy and not reality! No teacher can make you a good engraver. That is not a teachers job and frankly, no teacher has the ability to bestow those abilities on you. If they tell you they can they are lying to you to get your business. What is the teacher’s job??? The teacher’s job is to take the mystery out of the process for the student. A good teacher does have that ability. Part of that teaching process is to explain the engraving process in clear easy to understand language and in a way that the student “gets it”. The other part of that process is to guide the student in practice during the class to help the student know how to practice the various skills. A realistic expectation of a class is not that it will make you a good engraver but rather that it will teach you how to become a good engraver. 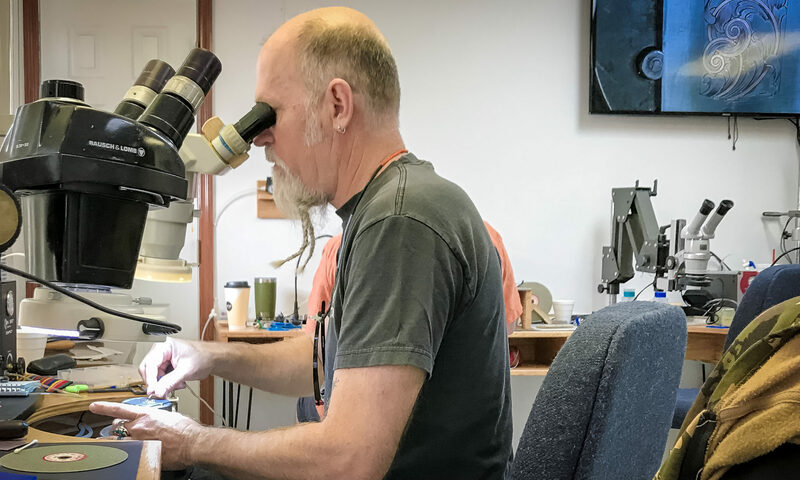 In other words, a good class will give the student the information needed to understand the process as well as teach the student how to practice the skills in order to master them that is indeed what will make you a good engraver. The correct information and lots and lots of correct practice. Engraving is a skill set that has a lot of content. There is a lot of knowledge to learn in engraving. Engraving requires a lot of muscle memory to master the cutting processes. The only way to achieve that muscle memory is lots of repetitive practice over time. Therefore, it takes a while to become a good engraver. How long? That varies from person to person. I have had students, who worked daily with their hands using tools, who picked it up rather quickly and within a few months of dedicated practice were doing pretty nice work. It takes longer for others. Can engraving be taught and learned? Absolutely!!! However, it is not a quick process and requires a lot of practice on the student’s part. A class will shorten the time it takes to acquire the knowledge and keep you from learning bad habits but it cannot remove the required time spent in practice.